Did you know that you can re-use tin foil? You can and many people do, finding that it saves them money and is kinder to the environment than using something once and throwing it away. Even if tin foil has food on it, it can still be re-used, even for the same purpose. Because it is so durable, many people simply wash and dry tin foil and then use it again. Just make sure that you wash and wipe it thoroughly to make sure all foodstuffs are removed. Some people are able to re-use tin foil over 20 times by washing and drying it. If you would prefer to only use the tin foil for wrapping food once, there are other uses for it too after it has been cleaned. 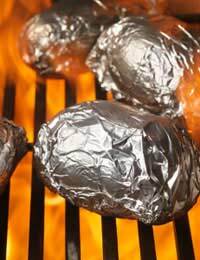 If you want to cut down on your oven-cleaning time and prevent a smoky cooker, use the foil to catch food that falls to the bottom of the oven. That way, you can simply remove the foil, rather than having to scrub the oven. Foil that you don’t want to use for food anymore also makes an excellent pan scrubber. Just roughly scrunch it up and the jagged edges will help dislodge stuck-on food and grease. If you have scissors with blunt blades, did you know you can sharpen them with aluminium foil? All you need to do is take a sheet of foil and fold it over multiple times. Then use the scissors to cut through the foil. Do around 10 cuts and the scissors should be sharpened again. Tin foil is a favourite crafty item for kids. This is also a good way to use up small pieces that you couldn’t really use for anything else. Foil is great for collages, home-made Christmas decorations and more. Some people also use foil for more effective and economical ironing. Place some smoothed foil underneath the ironing board cover. The foil will reflect the heat back, meaning the clothes are smoothed on both sides faster. If you’re sewing and using interfacing or putting an iron-on patch onto some clothing, the sticky side of the iron-on getting stuck on the ironing board cover can be a problem. Simply place some foil underneath the iron-on – it won’t stick to the iron. Sticking with the ironing theme, running a hot iron over a piece of foil a few times can get rid of any starch that has built up. As long as your foil is not dirty at all and has no odour, it can be used as pretty gift wrap. You can also use it to make garland-style Christmas decorations. One nifty thing you can do with aluminium foil is make a last-minute cake mould. Just double up two pieces of foil, to give its some structure and strength, and then bend into whatever shape you like, You could try a star or a flower or maybe get more ambitious. You can then place your foil mould inside a normal cake tin and cook as normal. As you can see, there are loads of ways to re-use tin foil. Hopefully this has sparked your imagination.